I'm growing everything green for a free and happy life. The best way to stop blossom end rot in tomatoes is to try and prevent it from happening in the first place. Having your tomato crop ruined by blossom end rot is very frustrating. After putting in lots of time and effort it’s hugely disappointing to lose parts of your harvest. Also once it starts it’s very hard to reverse. You can, however, limit the damage if you catch it early enough. What causes Blossom End Rot in Tomatoes? Before we get started it makes sense to explain what causes blossom end rot in the first place. Blossom end rot is not a disease. It is a mineral deficiency. If tomatoes don’t get enough calcium, the end of the fruits start to go black and end up rotting. A soil without enough calcium is sometimes a cause. So this is one of the important areas to look at. Most soils will actually have enough calcium anyway. But testing your soil before you start is till a good idea. What tends to be more important than calcium in the soil is the condition of the tomato plant roots and the soil. Because minerals are taken up through the roots, any damage to the roots or anything that affects the roots ability to take up minerals is an important factor. Soil conditions and root health are therefore two very important things to think about. Soil conditions can be affected by temperature, water content, fertilizers, compost content and the type of soil itself. Root health can be affected by any of the above factors plus of course digging and weeding which can cause serious damage to the roots if you’re not careful. In the detailed list below you can see how to manage all of those situations to reduce your chances of getting blossom end rot. With a bit of careful thought and consideration you can greatly lower the chances of your plants getting blossom end rot. One of the best ways to prevent blossom end rot in your tomatoes is to keep your soil moisture constant. If the soil moisture fluctuates too much this affects the roots. Either they will be too wet or too dry. The roots are then unable to take up nutrients as well as normal. When calcium isn’t taken up properly this leads to blossom end rot. Keeping the soil moisture reasonably constant or within a healthy range allows calcium to be absorbed and keep a good nutrient balance. If the weather is very dry you will need to water the soil twice a week. I would advise adding enough water to moisten the soil to around six inches in depth. You can stick your fingers into the soil to check. One way of helping to even the moisture in your soil is to use aqua cones. These release water as the soil needs it. This stops over watering or dehydration of the soil. Planting in wet conditions is difficult for the plant as well as you. The soils is thick and clumpy and it’s not easy to give the roots a gentle introduction to their new home. When soil is wet the air gaps between granules tend to fill up and working with the soil is hard. The soil forms sticky lumps and is very heavy. You can’t make a nice hole in what should be light soil for the starter plant to go into. The plant will be in a too tightly packed a space and the soil very unwelcoming. In this kind of heavy, thick soil the roots can be damaged and they find it difficult to establish themselves. As we know damage to roots is the last thing we want. Wait for a few days until the soil is dry and pant away. Tomato plants don’t grow well in the cold. The cold will badly affect root growth which in turn reduces the plants ability to take up nutrients. Remember blossom end rot is caused by a lack of nutrients. Specifically calcium. With underdeveloped roots there is little chance of the plant and roots getting the food they need. Avoid starting in cold weather if you can. It’d best to wait until well into spring and there is no chance of the ground freezing. It can be tempting to add lots of fertilizer thinking this will help your harvest. What happens when you add too much fertilizer is that there is a build up of salts and nitrogen in the soil around the plants. Although nitrogen is great for stem and leaf growth it also inhibits the growth of fruits. Too much nitrogen will promote a strong vine and leaves but slow down the growth of fruits at the same time. Too many salts can affect the plant in many different ways. Yellowing of the leaves, rotting roots, wilting leaves, slowed growth are just a few possible side effects. 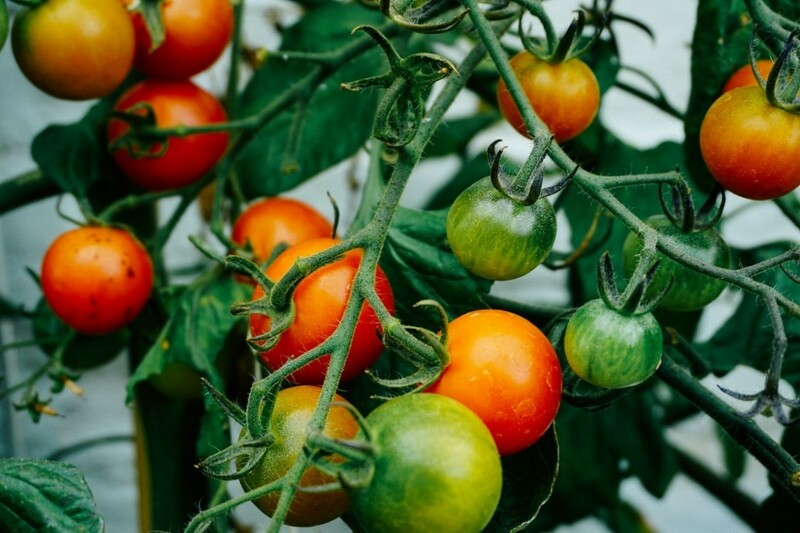 It shouldn’t surprise you to know that if the salt concentration in the soil is too high, your tomato plant will find absorbing water a lot more difficult than usual. Hence the wilting of leaves and discolouring. Make sure you follow instructions carefully on any tomato fertilizer that you buy. If you don’t know already, pH measures how acidic or alkaline soil is. The pH scale goes from 1-14. 1 is very acidic and 14 is very alkaline. 7 is neutral. For example, water is 7 and hydrochloric acid is 1. The ideal pH for tomato soil is from 6.0 to 6.8. You can test your soil with a cheap and easy home kit. If the pH of your soil is too high, adding lime helps to raise the pH back to a better level. If you have a high pH you should add some sulphur. I mentioned this earlier when talking about over fertilizing. Nitrogen is an important nutrient but must be given in the right amounts. Too much nitrogen will produce strong vines and lush leaves but will also slow down fruit development. Most fertilizers contain three main nutrients. Nitrogen, phosphorous and potassium. You need them in the right balance to feed both the plant and the fruits. If this balance is out of sink it can potentially cause your plants many issues. The easiest way to get the right balance is to pick a specialised tomato fertilizer. Try to limit any damage you might do to the roots of your tomato plant. If you are weeding or turning over earth around your plants be careful not to disturb or break any roots. As you now know, blossom end rot is caused by a lack of calcium. Damaged roots affect the plants ability to up take nutrients including calcium and can lead to deficiencies. So be careful when digging around your plants and try to limit any disturbance or breakage to your tomato plant roots. Mulch is a mix of decaying leaves, grass and organic matter. There are many different kinds but usually they have leaves and grass clippings or wood chips as their main ingredients. You just add a layer of it on top of your soil and you get a number of benefits. One of the main benefits of mulch is that it keeps the soil moisture constant. The mulch will absorb a lot of moisture during watering and it slowly releases it into the soil. A consistent level of moisture keeps the tomato plant roots happy. It also forms a protective layer on top of the soil slowing down soil moisture evaporation. Water from the top of the mulch is evaporated while the bottom of the mulch stays moist. This helps to slow down evaporation from the soil and keeps the soil damp for longer. Mulch is also a great insulator from quickly changing weather conditions. In warm weather the soil is kept cooler, and during a drop in temperature it helps to keep it warmer. As an added extra, weeds are prevented from growing. Weeds find it difficult to grow through the mulch layer. If any manage to poke their way through, they are then pretty easy pickings. At the end of the season you can mix the mulch into the soil to give it extra nutrients. If you pick certain tomato varieties this will increase your chances of avoiding blossom end rot. Smaller tomatoes are better at resisting the calcium deficiency and some tomatoes are far more susceptible. Plumb tomatoes, pear and elongated tomato varieties are more likely to get the disease. Cherry tomatoes almost never suffer from blossom end rot. A study was carried out by the University of Illinois to see which tomatoes were good at resisting blossom end rot. They found a few varieties that have low incidence even in years where the calcium deficiency was a large problem. This list of varieties had less than 10% blossom end rot even in bad years. This list had 10-30% blossom end rot in bad years. As well as the pH test, you can do a more thorough test to show the mineral make up of your soil. Although the pH test is good it’s not giving you the full picture. With a full soil test you get to know what minerals are in your soil and at what levels. With test you will need to take a soil sample form you garden and send it off to a lab. The great advantage of this test is that you will get a report telling you exactly what you need to add to your tomato garden to give it the right conditions. 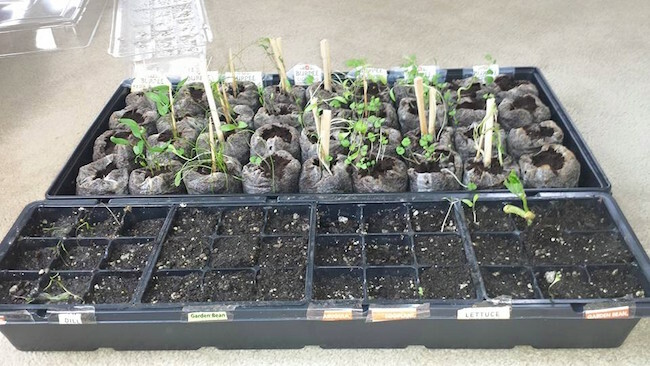 When you take a sample make sue you take it from various parts of your planting area and get under the soil to about six inches. Mix all the sample you have taken together and send that mixture off to the lab. If you don’t support your tomatoes properly, they can fall onto the ground. This can increase the risk of the plants getting disease and being eaten by bugs. By holding up your tomato plants, you keep them away from many nibbling insects and reduce the chance of many harmful diseases. 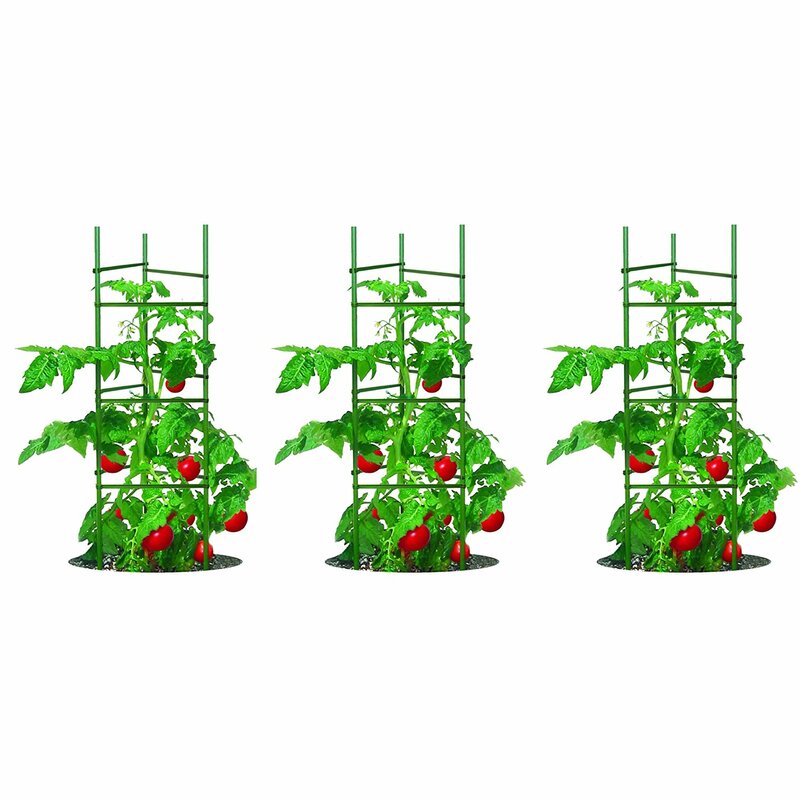 Tomato plant support cages offer the perfect solution. They are easy to set up and keep your tomato fruits well away from potential harm. 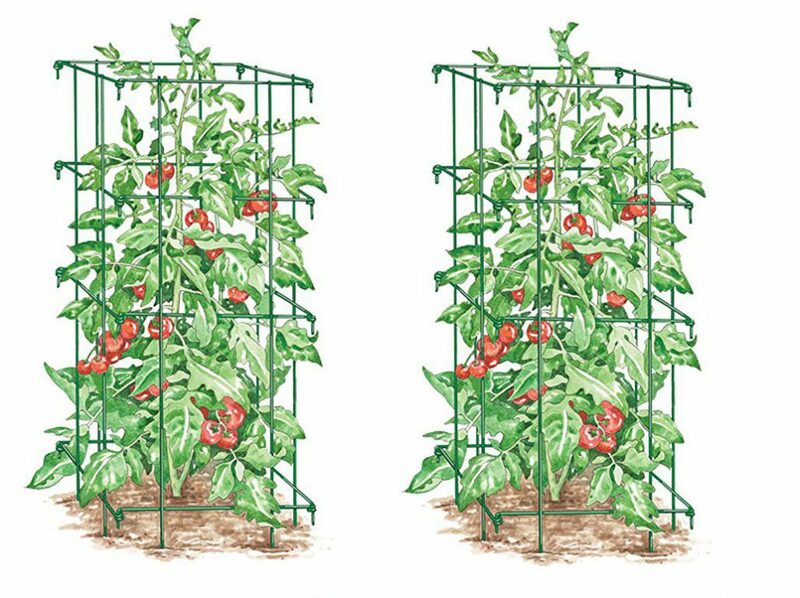 Take a look at our 7 best tomato support cages and see what takes your fancy. This comes in a two pack and is from the Gardeners Supply Company. It’s tall, sturdy and long lasting. Very Tall: This is a very tall cage which can maximise the height of your tomato plant. The cage is 53″ tall inches after putting the legs into the ground. Strong and Long Lasting: The frame has a heavy gauge steel interior and is powder coated to prevent rust and make the cage last for many seasons. Easy Harvesting: A wide frame makes harvesting easier and allows a bigger, lusher tomato vine. This means you can get at the tomatoes more easily when they are ready to be picked. No Ties Needed: You can train the plant as it grows over the framework. Because of this there is no need to tie the plant to the frame. The plant will naturally grow around the framework and support itself using the cage. Collapsible: It is possible to collapse the frames in winter which makes them very easy to store. They fold up into easily storable flat packs. Fixes Well: The frame has eleven inch legs. This means that you can fix the frame very firmly into the ground. However, it is recommended by the manufacturer that use earth staples when there are windy conditions. Please Note: This is a great strong frame with long legs to fix it into the ground. However, it may be wise to use earth staples to prevent the structure blowing over in windy conditions. Also from the gardeners supply company, these are very similar to the tall towers above. They are just a bit shorter. Fair Height: They are 20″ shorter than the tall cages. However, they still have a reasonable height for your tomato plants. 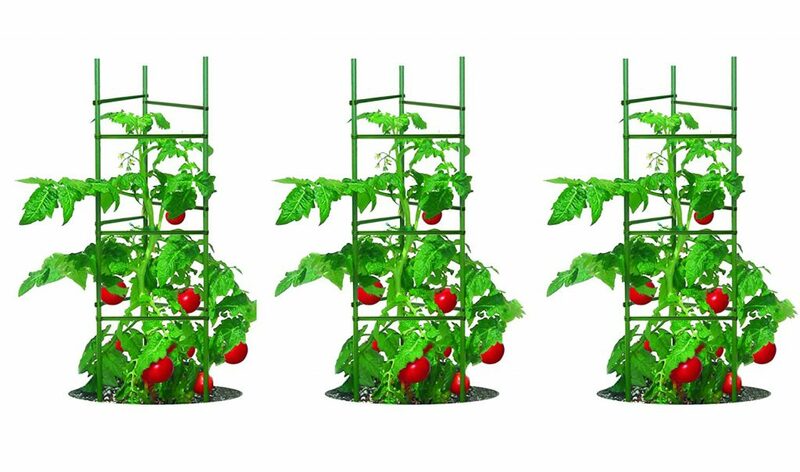 Strong and Long Lasting: These thick heavy gauge steel tomato cages have been coated with a special powder paint that gives them extra durability. According to many reviews on Amazon, they will even last happily throughout the winter. Wide: They are tall and wide. 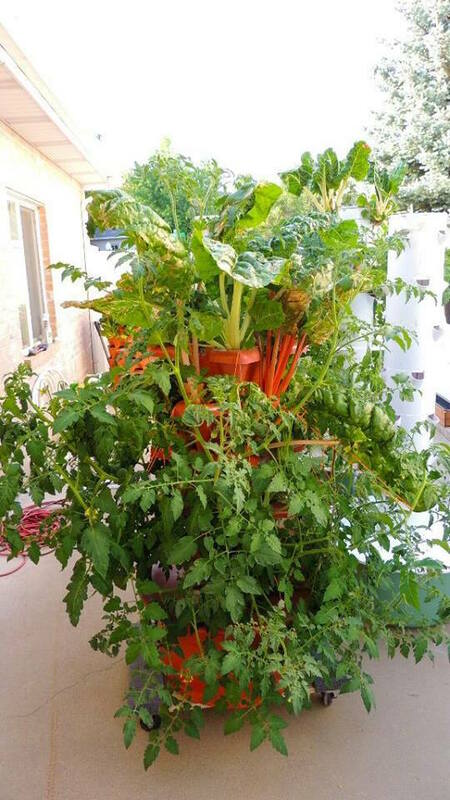 This encourages your tomato vine to grow upwards and spread out. This can lead to a better crop and the wide cages make harvesting much easier. 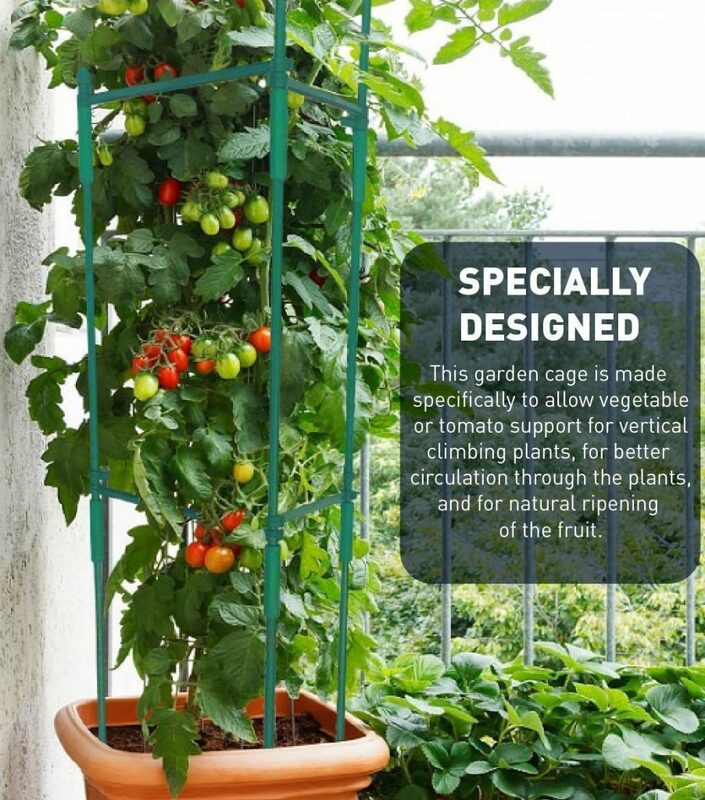 Support Large Crop: The sturdiness allows the cage to hold up a fully grown tomato crop and it’s fruits. Some wire cages have a tendency to bend and lose their shape when a tomato plant is getting on the bigger side. No Ties Required: With this cage, you won’t need to tie the vines to the framework either. Simply wrap the vines around the cage frame as they grow. Collapsible: The frames collapse which makes storage easy. Please Note: One negative is that the feet of these cages are not very long. They can stick into the ground but to be on the safe side it would be wise to fix them with steaks or earth staples. This is a more traditional tomato support with a conical shape. The steel frame gives good support and the long legs help fixing into the ground. Strong Frame: The Gilbert and Bennet Tomato frame is another strong one. The legs are 7 gauge steel and the main frame is 8 gauge steel. The makers claim it can support a ten pound tomato plant. Galvanised: This places a secure non reactive coating over the frame which will protect it from rusting. Because of this, this cage should last for many years. Long Legs: The long legs of the frame allow you to secure it into the ground without having to fix them with anything else. Colour selection: You can choose from a number of colours to suit your gardening tastes. Please Note: This frame is not collapsible. It’s long legs should mean no earth staples are required. But as usual, to be on the safe side, we advise using earth staples in case of windy conditions. These tomato plant supports are tall, strong and narrow. They give great support and can be uses in a small space. 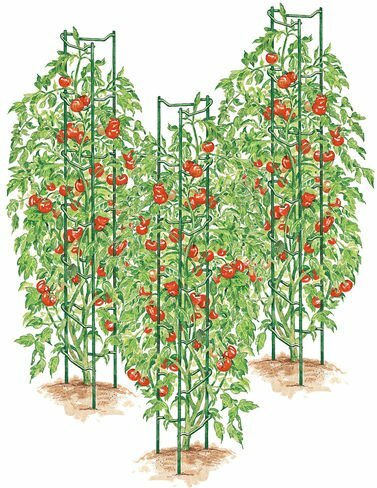 Very Tall and Strong: At 57 inches high and with 7mm steel, this tomato frame is tall and sturdy. The makers claim it can support 100lbs of tomatoes. Long Lasting: The frame is covered with a powdered coating which will prevent rusting and make the set last for many seasons. Good Support: The joining rungs are shaped with a dip in the middle. This gives a nice place for the vines to hang and support the tomatoes. 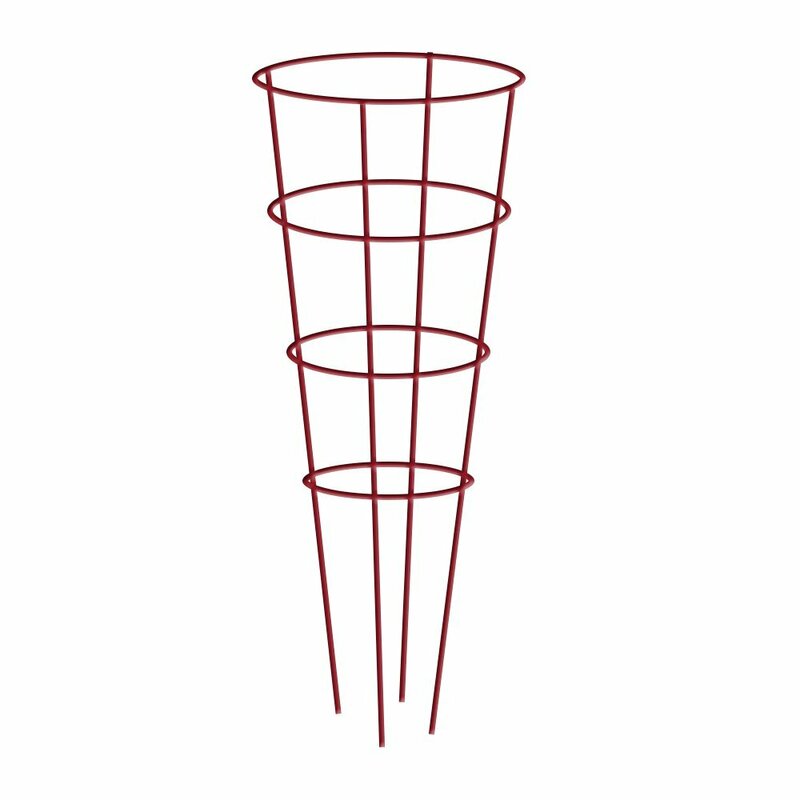 Specially Shaped Rungs: The dipping joining parts allow for easy training of the vines as they grow upwards. 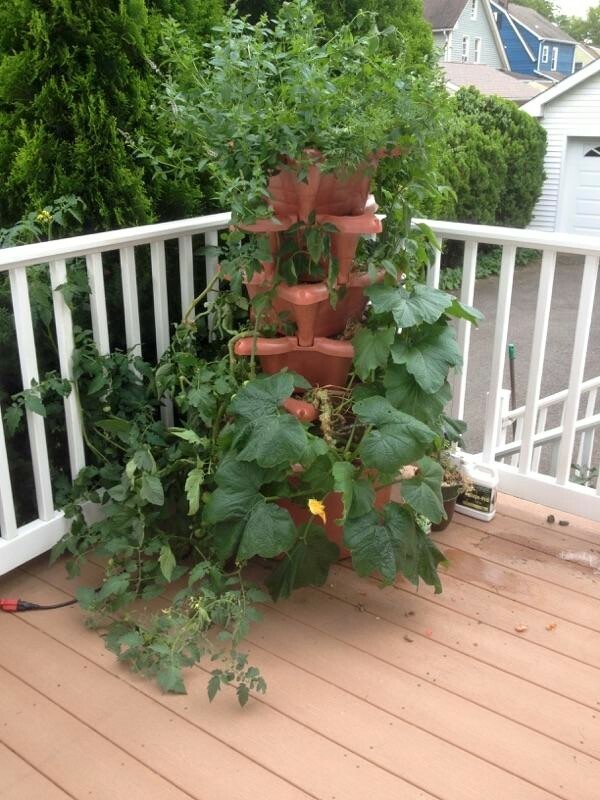 You can wrap the vines around the rungs and they will support your tomatoes in the dip. Maximize Gardening Space: Because this frame is narrow it can maximize gardening space. You can grow more tomatoes in a smaller space. Long Legs: 13 inch legs give you more than enough to drive this cage into the ground and provide great support without any extra help. Please Note: Some people prefer wider cages than this for easier harvesting. If you have limited space this is a great set of cages. Once again, in case of windy conditions we advise earth staples. These tomato cages are quite tall. They have a strong central core and are coated in plastic. They come in a handy three pack. Strong: This is yet another tomato support cage with a steel frame coated with a plastic covering. The steel frame gives strength to the cage while the coating stops rusting. This should be able to last for many years. Easy Assembly: Place the three main rods into the ground and snap on the supporting beams. This is a very easy set up. Snap on Arms: The frame is made up of three main rods and nine beams. The beams easily clip onto the main rods giving the tomato plant a framework to grow around. Adjustable: The arms can be moved up and down as the plant grows, This helps you give your tomato plants the correct support at all stages of it’s growth. Five Foot Stakes: The five foot steaks give enough height for your plants to fully flourish. Easy Storage: All the parts can be dismantled and stored away in a small space. Range of Accessories: Extra arms, rods, twine, support rings and more are available. Please Note: There are very mixed reviews on amazon for this product some claiming that it’s very flimsy. However with over 400 reviews giving an average of 4 stars you are likely to be safe. You will have to assemble this one, but it’s not too hard. The adjustable cross beams are an added benefit to this support system. Strong: The main framework of this tomato cage has a steel core. This framework is coated in plastic which makes it last much longer. This way you have a strong frame and one that won’t be affected by the weather. Easy Assembly: To assemble you stick the frame into the ground then attach the plastic arms. The assembly is very easy as the arms clip onto the main rods. Special Design: The makers claim this is a special design to encourage and support growing vine fruits. This is shown in the feature of moving support beams. You can move the support beams up and down to follow the growth of your plant. So as your plant is growing you can start the support low and move it up as the plant gets bigger. This means that your plant is supported all the way through it’s growth. 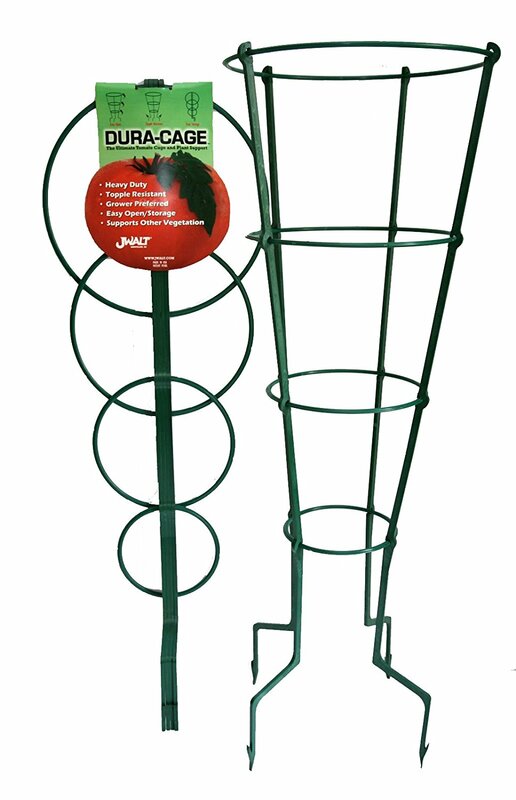 Easy Storage: This is another easy storage tomato plant support cage. You can dismantle the parts and store away in a small space for the winter. Please Note: The height will be less once you put the rods into the ground. Sturdy: The Dura cage tomato supports are very sturdy. They are made of thicker than usual plastic. The plastic is very strong so they can keep their shape unlike many thin wire supports. They will also last a long time. Light Weight: Because they are made of plastic the Dura cages are light weight and very easy to work with. Collapsible: They have a clever ability to collapse so they can be easily stored. When taken out of storage they are equally easy to assemble. Just hold the frame upright and the circular parts fall back into place. Long Legs: They have long legs which you can insert into the ground to hold the frame in place. This fixes them well into position and stops them from falling over. Won’t Rust: Being made of plastic means they won’t rust or rot away. Please Note: A recent customer review on Amazon has said that these cages are not as sturdy as they once were. Earth staples are also advised. Be careful to check for durability and strength. Also look for how long the legs are. These determine how well fixed into the ground your cage will be. Lastly check if you need any other extras to fix the cage into the ground or to tie the tomato plants with. 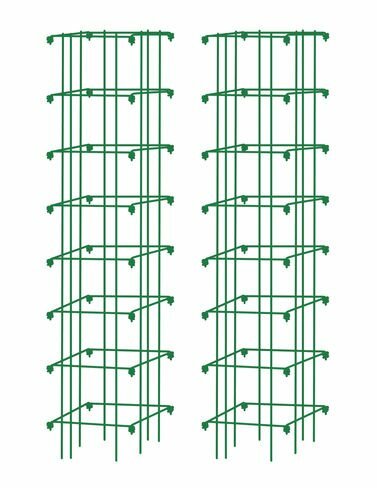 If you have any questions about our picked tomato plant support cages or have any better suggestions please let us know in the comments below. Many thanks, Rob. Do you have weeds? Do you want to improve the quality of your existing grass? Are you starting from scratch? 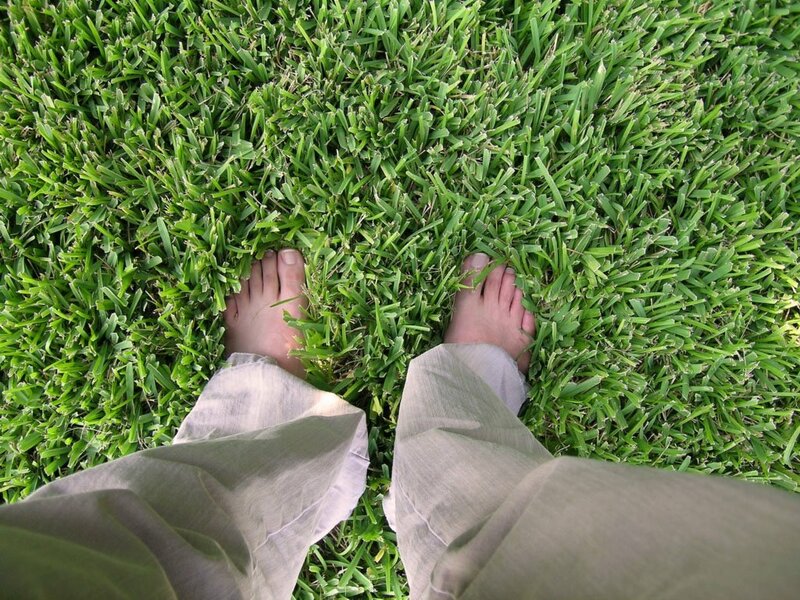 The best fertilizer for grass varies depending on your own personal needs. Each situation has it’s own requirements and that’s why we’ve selected the best fertilizer for each problem you might have. Whether you’re starting a new lawn, sorting out existing grass or feeding in different seasons there’s something on this list for you. 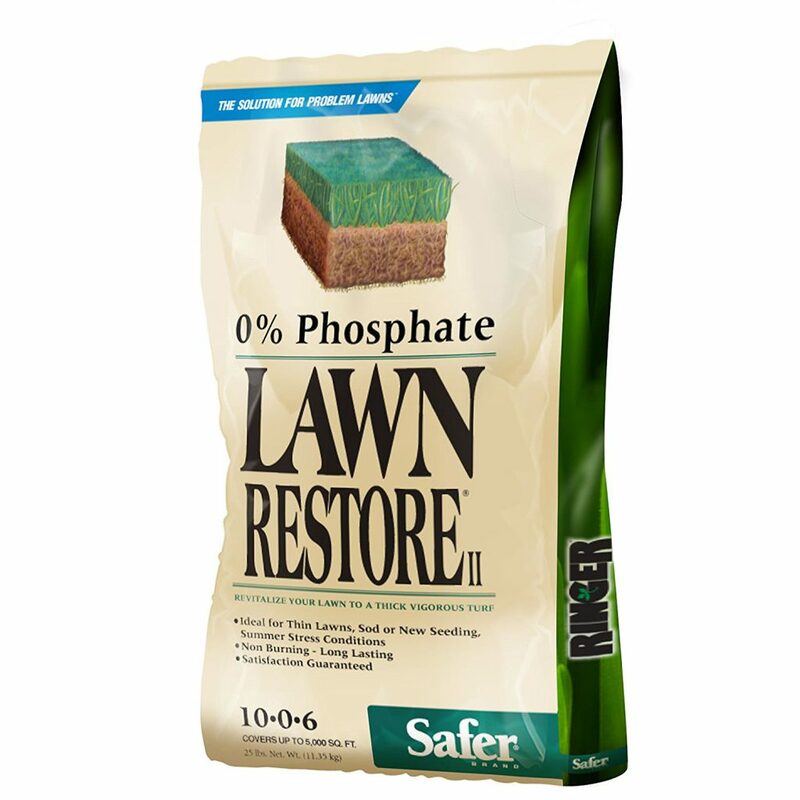 Starter fertilizers for lawns and grass have a higher concentration of phosphorous. This promotes root development and helps the grass to fix itself in the ground. This is very important in building a healthy foundation to your lawn. These fertilizers are best used with seeds, sods or grass plugs. Notice the high phosphorous content of this fertilizer. 18-24-6. Phosphorous is the mineral that encourages root growth in new grass. 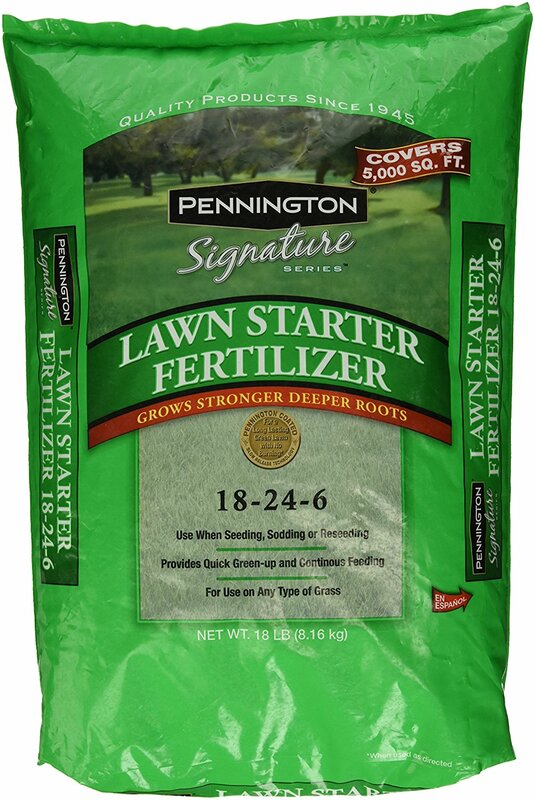 This means that this fertilizer is perfect for starter lawns. I would highly recommend this fertilizer. Not only that, Pennington have been going since 1945. This experience shows in the quality and reliability of their products. It’s also safe with any kind of grass. High Phosphorous: Promotes strong roots. For all Starter Grass: Works well with sods, grass plugs and seeds. Slow Release Nitrogen: Continues to feed the grass over time. Winter Protection: Strengthens grass to last through winter. Root and Blade Development: Strong roots and large green blades. 5.000 Sq Feet: Covers 5,000 Sq Feet. Larger bags also available. High Phosphorous: Phosphorous is the mineral that helps grass to lay its roots and build the foundations to a strong and healthy lawn. For All Starter Grass Types: Works well with all methods of starting a lawn from scratch. Grass plugs, turf sods or seeds. Slow Release Nitrogen: Nitrogen feeds the blades of the grass. This is slowly released for up to four months continuing to help the blade growth throughout that time. Winter Protection: With a good root foundation and strong healthy blades, your grass will fair better in winter months. 5,000 Sq Feet: An 18lb bag covers 5,000 Sq Feet. Larger bags are available to cover more surface area. 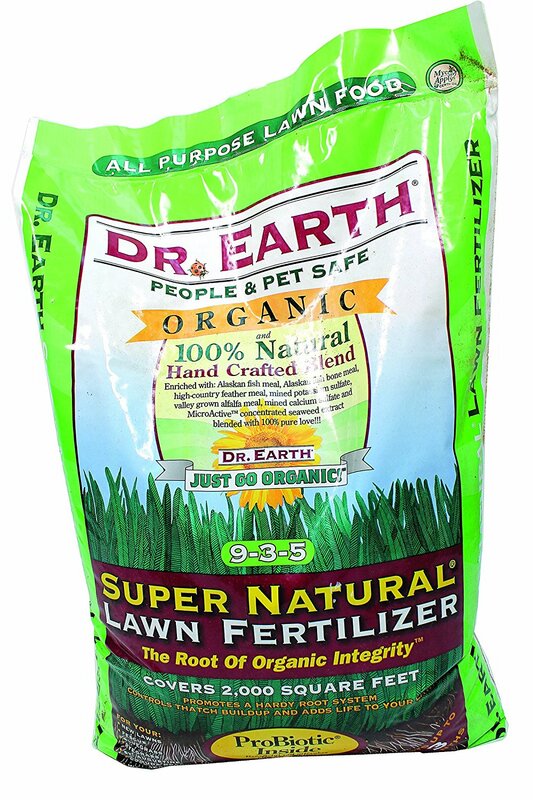 This fertilizer makes my list because it has the perfect balance of nutrients for starter lawns. It’s also from a very well established and reliable brand. This one’s ideal for getting a lawn kick started together with, seeds, sods or grass plugs. It significantly improves the speed of growth from grass seed. Also works very well with new sods and grass plugs. We chose this one because Scotts is a well known, popular and very reliable brand. Sods, Grass Plugs, Seeds: Works well with sods, grass plugs and seeds. Nutrient balanced: perfect balance for thick, strong lawns. 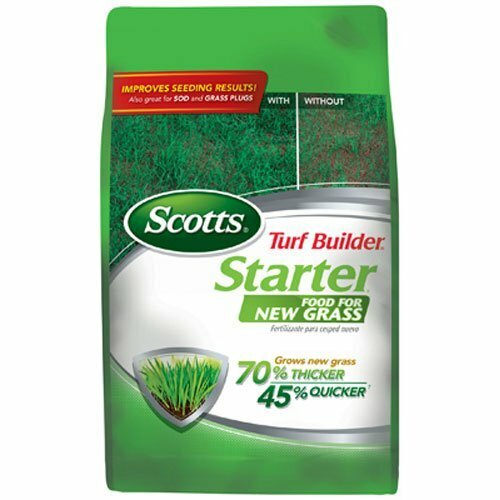 Thicker and Faster: According to their literature Scotts Starter Food will make your grass grow 70% faster and 35% thicker than without any fertilizer at all. Strong Roots: Starter Food actively encourages stronger routes for your grass. This means, once established, your lawn will stand up well to mowing and cutting. Feed Sods And Grass Plugs: If you’ve started your lawn with grass plugs or sods this fertilizer is perfect to get things moving along significantly faster. Root and Blade Development: Specially formulated to result in strong grass from the bottom to the top. Nutrient Balanced: Contains the correct balance of nutrients for strong and healthy lawns. This makes my list because it’s specially designed for starter lawns with seed, sods, or grass plugs. Scotts is also one of the best selling brands in the USA. It’s very reliable and does the job it says it will. Weed and feed fertilizers are normally for already established lawns that have run into some problems. Maybe your grass has gone a bit thin. Maybe it has a weed problem. If you haven’t guessed already, a weed and feed fertilizer will kill the weeds and give some extra food to your grass at the same time. This time I am recommending Scotts over Pennington. Mainly because this is a very strong formula that really thickens your lawn so well that weeds should struggle to come through afterwards. Very Strong: Weed and feed is two times stronger than the previous formula. It’s Scott’s strongest formula. Kills Dandelion and Clover: These are two of the most pervasive and stubborn weeds that appear on lawns. 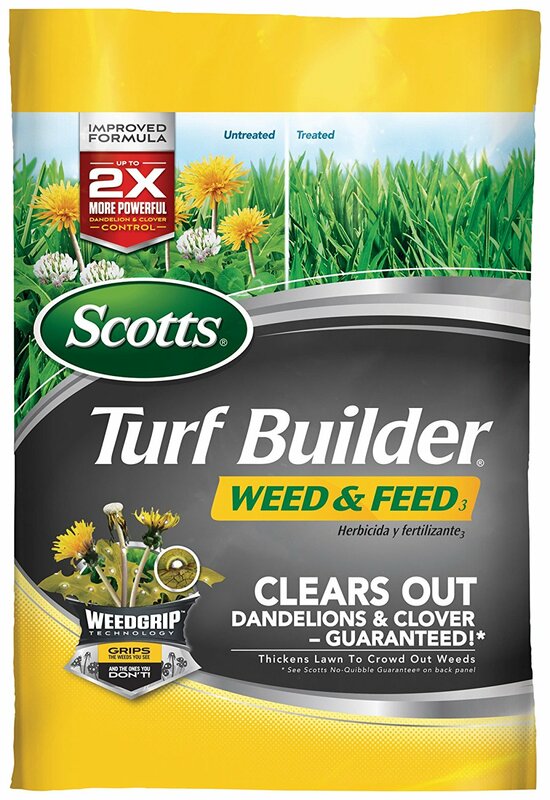 Scotts weed and feed kills them outright while maintaining and improving the quality of your grass. Weed Grip Technology: The manufacturers claim that weeds you can and can’t see are “gripped” by the fertilizer. Drowns Out Weeds: Your lawn will thicken and strengthen so much that weeds struggle to come through again. Very strong formula which kills off the dandelions and clover without harming your grass. Feeds and strengthens grass extremely well. Notice the high nitrogen content in this one. 28-0-4. Nitrogen promotes the growth of the grass blades. This will help thicken your lawn and reduce the amount of weeds that can get through in the future. Over two hundred and fifty different kinds of weeds can be killed using this fertilizer. Kills Stubborn Weeds: White clover, dandelion, plantain, , spurge chickweed and many others. Kills Over 250 Weeds: A three part herbicide mix in this fertilizer helps to kill a very large variety of weeds. This should ensure a clean and fresh looing lawn. Kills Stubborn Weeds: Even the difficult to kill and well known stubborn ones like dandelion and white clover will be gone. Added Nitrogen: Added nitrogen helps feed the lawn to make the grass blades bigger, stronger and greener. 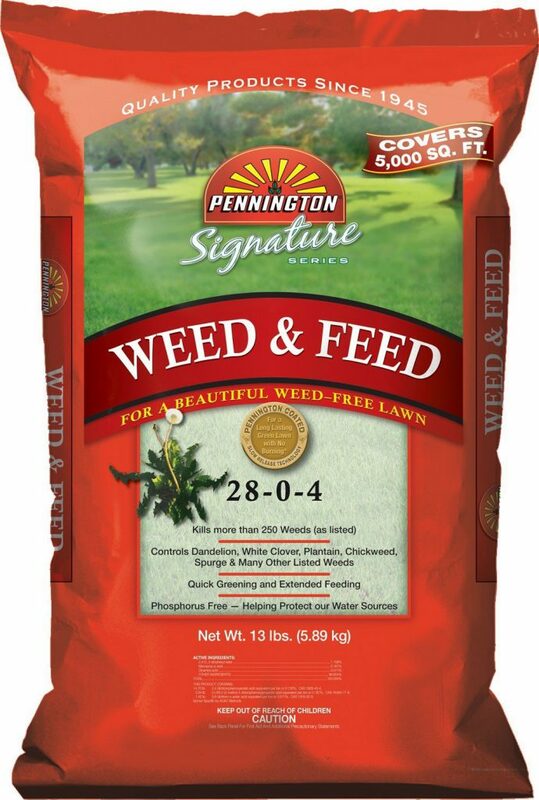 Pennington’s Weed and Feed makes my list because it can kill over 250 types of weeds. It also has a very high level of nitrogen to promote strong, green grass. Lush lawn Colour: Rich and deep coloured lawn. Completely Plant Safe: Will never burn plants or grass. #1 Rated: Rated number 1 organic fertilizer by wiwkievez . Lush lawn Colour: Rich and deep coloured lawn with all natural ingredients. Maximises Microorganism Activity: This means the grass can uptake the nutrients very quickly leading to a healthier lawn and soil. Develops Bigger Roots: Bigger and stronger roots allows the grass to absorb water more effectively. This keeps the grass blades bigger and stronger and able to cope with more diverse weather conditions. Completely Plant Safe: Will never burn plants or grass. Many fertilizers can burn plants if not diluted properly or used in the wrong way. Shin Nong Grass Food does not have this problem. It was voted number 1 organic lawn fertilizer by wiwkievez. It won’t burn your grass, is fully organic and gives your lawn a beautiful lush and deep green colour. Fully organic and safe for children and pets. Safe: Safe for people and pets. Slow Release Formula: Slowly releases over three months. Conserves Water: Strong root system takes up more water more efficiently. Covers 2,000 sq Feet: 18 Lb bag covers 2,000 square feet. Contains Mychorriza: Fungus that grows in soil and helps roots. Improves Overall Soil Environment: Adds natural microbes. Fast Acting: plus continuous feeding for up to three months. 100% Organic: All natural components including fish meal, bone meal and seaweed extract. Safe: Non toxic ingredients mean that pets and family can play on your lawn right after using the fertilizer. Slow Release: Minerals are slowly released to continuously feed the lawn over three months. This means you only need to apply once and your grass will keep being fed for three months. Conserves water: Thicker roots will maximises efficiency of water uptake by the grass. Less watering will be needed saving water in the process. Covers 2,000 sq feet: One 18lb bag is enough o cover 2,000 square feet. Contains Mychorriza: Specific fungus that works in tandem with the roots. This promotes healthy roots and nutrient exchange between the fungus and grass. Improves Soil Environment: Microbes and fungal parts improve the soil ecosystem. This gives a healthier and more beneficial soil for the lawn. This one makes my list because it’s organic, and pet and child friendly. Great for restoring faded or thinning lawns. This is a fully organic lawn restore solution. No animal products are used in this fertilizer either. Plant Based Nutrients: All plant and no animal. Plant Based Nutrients: All plants and no animal parts makes this both eco friendly and ethical. Large Area Covered: With 5,000n sq feet per bag you can cover a large grassy area and still leave some for another time. Restores Green Fast: Within a few weeks colour is restored to your lawn. Root Growth: Without the use of phosphate, this fertilizer strengthens roots through the organic microbes and plant remains in the pellets. This one makes my list because it’s totally organic and uses no animal products either. Bring back colour to yellowing plants and lawns. A favourite with parks and golf courses this fertilizer helps brighten up faded lawns and promotes a deep green colour. *Caution: – Keep away from children and and pets. Will stain concrete and stone surfaces. Repairs Faded Lawns: Improves the colour of faded lawns. Adds Iron: Adds Iron to your lawn to produce deep green colour. Can Use With flowers and Vegetables: Suitable for flowers, shrubs, trees and vegetables to add iron. 8,000 Sq Feet: 1 pint when diluted covers 1,000 sq feet. Repairs faded Lawns: Often light coloured lawns can be due to an Iron deficiency. 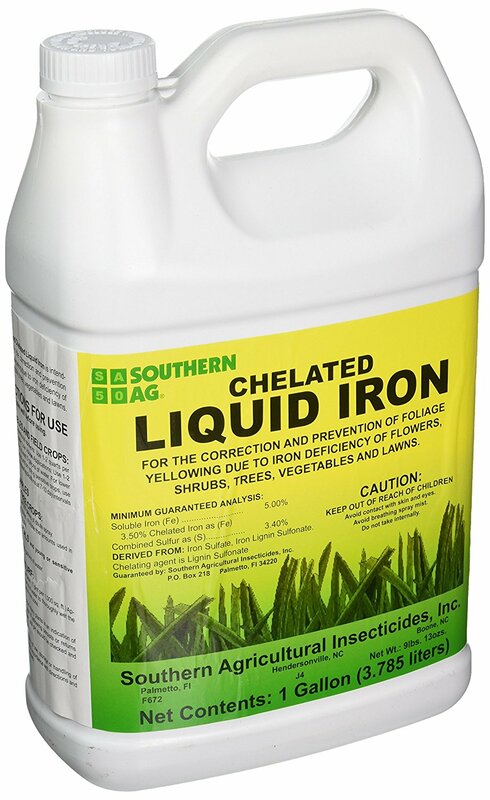 Southern AG Chelated Liquid Iron adds the required iron to bring back that beautiful deep green colour that we all love about lawns. Adds Iron: As just stated adding Iron to your lawn or other plants can bring back the green to the leafy parts of plants. Use With different Plants: Can be used with many different plants including vegetables, flowers, trees, shrubs and grass. 8,000 Sq Feet: When diluted the gallon will cover up to 8,000 sq feet. 1,000 sq feet per pint. 4.5/5 start rating on Amazon from 51 reviews demonstrates the reliability of this product. Perfect for revitalizing faded looking lawns. Please comment below with any questions. Which one works best for you? Or have I missed out any that you got great results from. I am always happy to hear form you. Using the wrong kind of fertilizer can really cause issues with your tomato crop. Two common examples are, the end of the fruit rotting, and small green tomatoes. 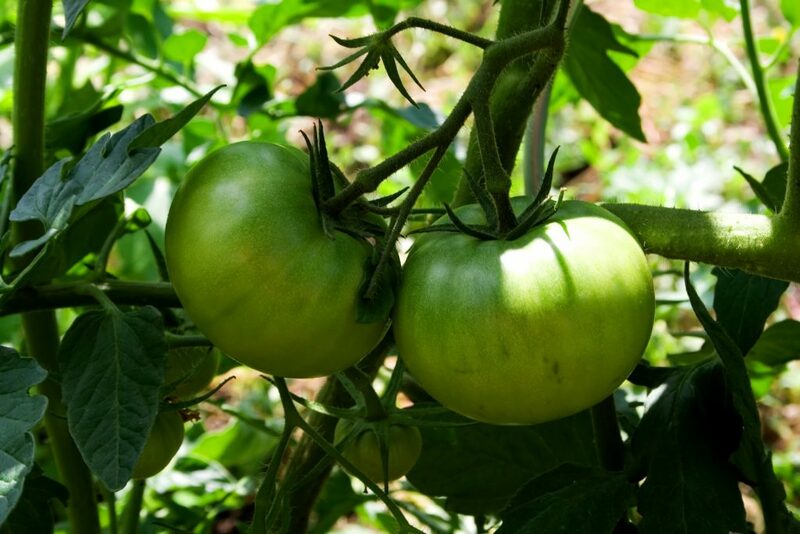 The best fertilizer for tomatoes has the correct balance of essential nutrients. This helps to prevent plant health problems and encourages both a healthy vine and plump fruits. What Makes the Best Tomato Fertilizer? The best tomato fertilisers have the correct ratio of three basic plant nutrients: nitrogen, phosphorus and potassium. This balance is called the N-P-K ratio. A good ratio for tomatoes in normal soil is 5-10-5 or a 5-10-10. You are looking for less nitrogen overall than the other nutrients. For example, too much nitrogen makes the leaves big but the tomatoes end up very small. Nitrogen is required, but only in the correct balance with the other nutrients. 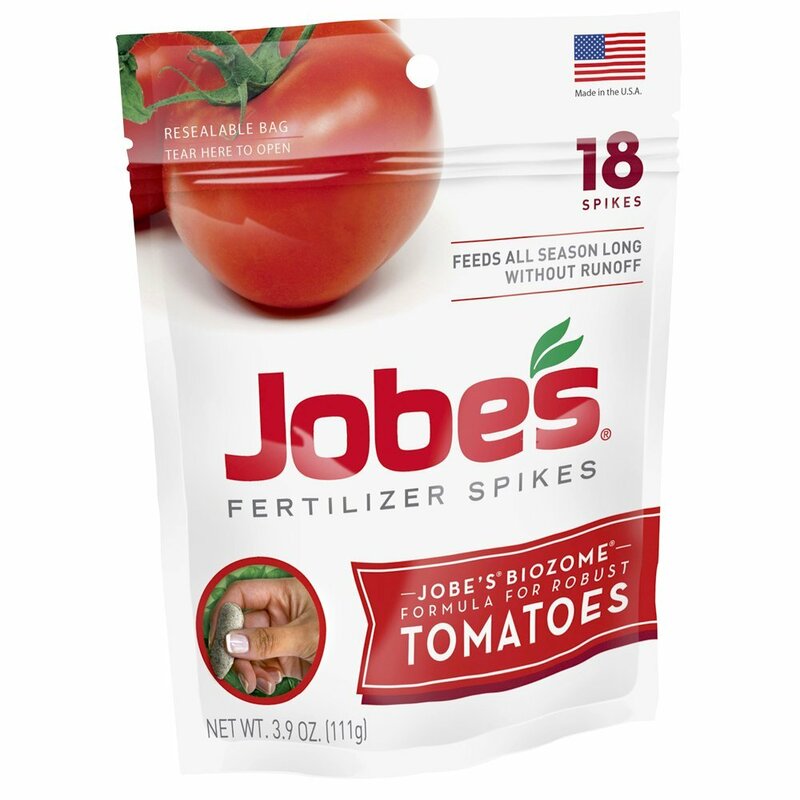 A really easy fertilizer to get started with is Jobes Tomato Spikes. Simply stick them into the soil and they will slowly release all the appropriate nutrients in the correct time. If you’re after an all in one solution, the Sow and Grow Box from Nature’s Blossom is utterly ideal. It has everything you need to get started. It even allows you to grow four different kinds of tomatoes from the get go. What if I’ve Had Problems Before? The most common problem for tomato plants is blossom end rot. This is when the end of the tomatoes go soggy and black. This is mainly due to a deficiency in calcium. Starting to grow in wet weather or the tomato fruits resting on wet earth may also cause this. Many of the fertilizers in our list below have added calcium to help with this problem. Have a look in our list and pick one with a high calcium content. For this we recommend Tomato – Tone. If you’ve had a strong vine but no or small tomatoes you may have been using too much nitrogen. The fertilizers in our list below have the correct balance of nitrogen and other nutrients. This should help your problem. It’s Ok to add a high nitrogen fertiliser early on to help the growth of the vine. You can then choose to balance it with another fertilizer once the plant is closer to bearing fruit. Alternatively you could pick any of the fertilizers in our list below that will do the job from start to finish. It’s much easier to use a specially designed fertilizer right the way through. You can avoid making mistakes and spoiling your tomato harvest. This is especially true if you are growing for the first time. You could even use the sow and grow all in one option which has everything you need from start to finish. That’s why we’ve selected the most suitable fertilizers with the correct N-P-K ratio for tomatoes. There’s no need to use different types during the growing process. Pick one of the fetilizers below that fit your needs and you’re good to go. Great for beginners and small crops, this is a quick and easy solution. Easy To Use: These ones make our list partly because they are just so easy to use. The pre-measured fertilizer spikes will slowly release the nutrients that your tomatoes need over time. No Waste: Just insert the spikes into the soil and they will automatically give out nutrients at appropriate times. This cuts down on waste and mess. This method also has less odours than many fertilizers. Direct To Roots: The nutrients are given out below the surface of the soil directly to to the growing roots. A pretty efficient method. Long Lasting: Each spike will feed your tomato plants for eight weeks giving nutrition for the full growth period of the plant. Nutrient Ratio Guaranteed: A guaranteed fertilizer ratio of 6-18-6 means your plants et the correct N-P-k ratio for optimal growth. 18 Spikes: Jobes recommend 2 spikes per plant. This means 1 packet should be enough for eight healthy tomato plants. This one makes our list because it’s just so easy to use. Very convenient, especially for first time growers. Fantastic for beginners . Ok, Ok, I know this technically isn’t only a fertilizer but we just love this special starter kit and had to share it. Money Back guarantee: If you’re not 100% satisfied get your money back. Grow 4 Different Types of Tomato: Grow green zebra, blue cherry, yellow pear and red tomatoes. Much more fun than just one type. Have super salads or dishes with different colours and textures of tomato. Everything You Need in a Box: Absolutely everything you need to grow tomatoes from scratch is contained in this box. All equipment and tools are provided. 4 biodegradable planters, 4 plant markers, 4 seed packets, 4 soil disks, full instructions and growing tips. Certified Organic: This starer kit is 100% certified organic. 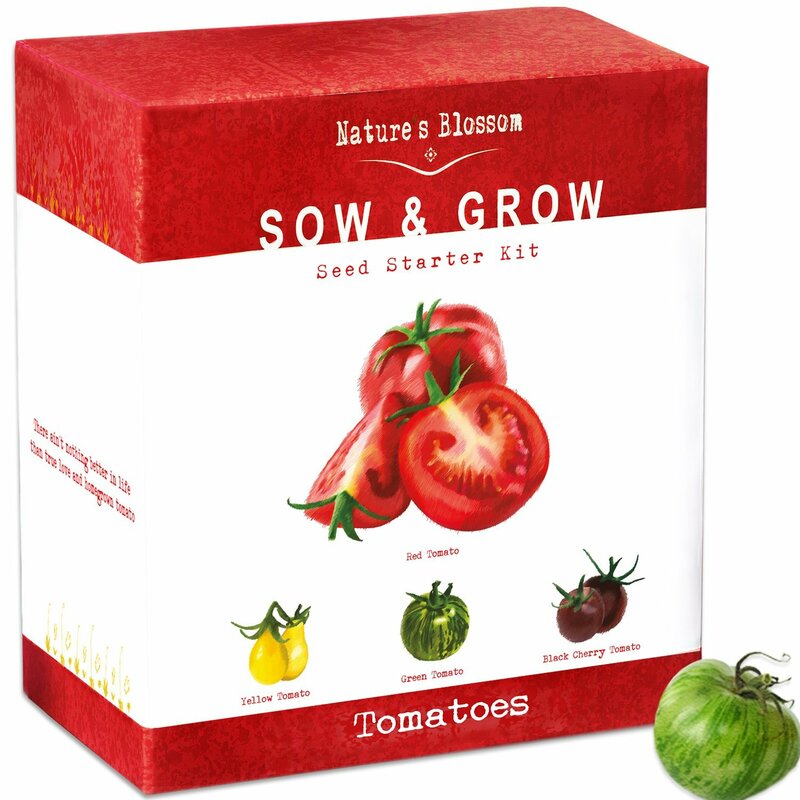 Beginner Friendly: With everything contained in one box and full step by step instructions this is a great way to get started in tomato growing. Indoors or Out: This convenient kit can be used indoors or outside if you wish. This allows for growing in winter if you want to. Fun: Personally I think this kit is a lot of fun. Especially as it allows you to experiment with four different kinds of tomato plant. Great Gift: As it’s all contained in one box, this makes for a great gift. Have you had blossom end rot before? This all organic, long lasting, and well balanced formula prevents blossom end rot. It’s also great for the environmentally friendly gardener. Organic: We like this product because it’s an approved organic product and contains thousands of living microbes. 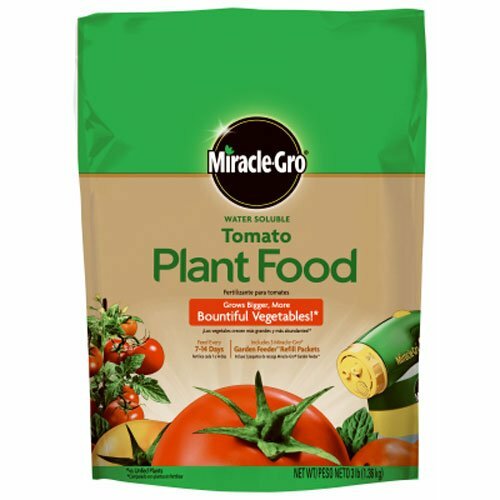 Specially Formulated: It’s specially formulated for tomato plants providing safe, steady and correctly balanced nutrients. This should help you avoid any problems associated with nutrient imbalance in tomatoes. Prevents Blossom End Rot: The special formula helps prevent blossom end rot. 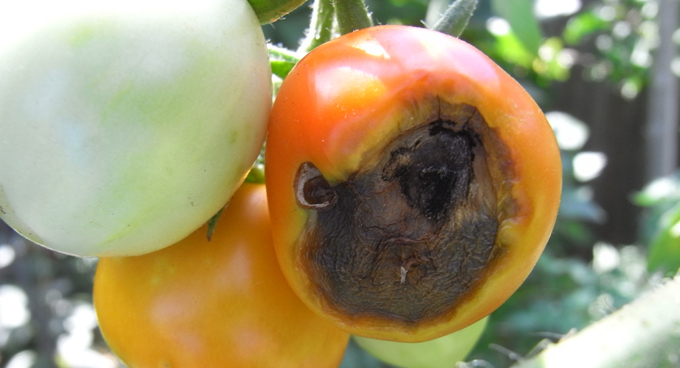 A very common condition caused by an incorrect amount of calcium in tomatoes which makes the end of the tomato become black and rot. 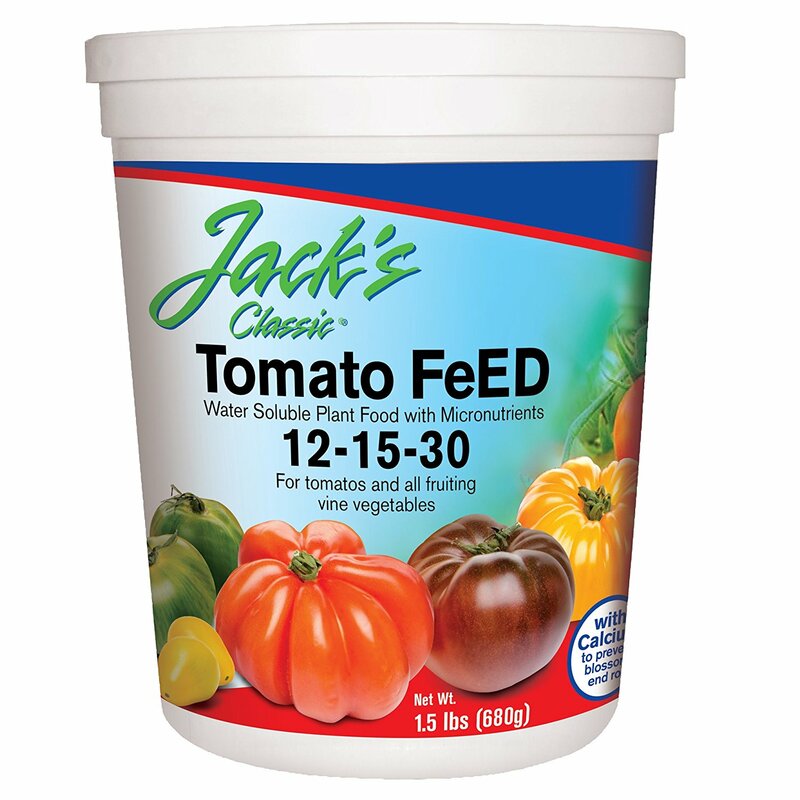 15 Essential Nutrients: Tomato-Tone contains all 15 essential nutrients for healthy tomato plant growth. This should promote very healthy tomato fruits. 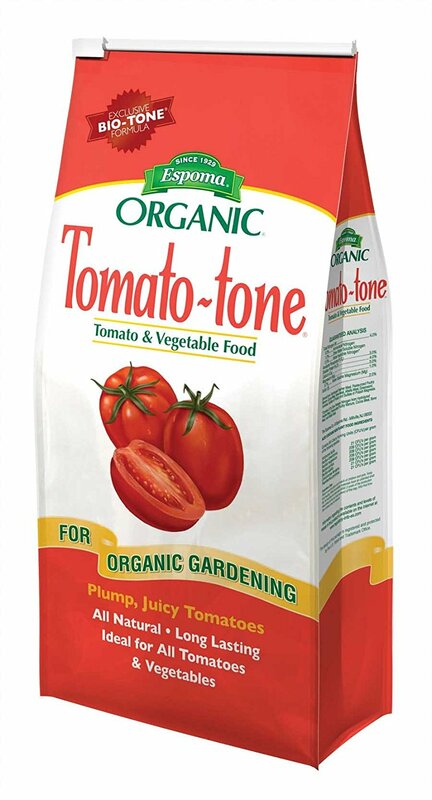 Environmentally Safe: As an organic product, Tomato-Tone is of course environmentally friendly. No toxic or dangerous ingredients or sludges. This one makes our list because it’s all organic and produces plums tasty tomatoes. 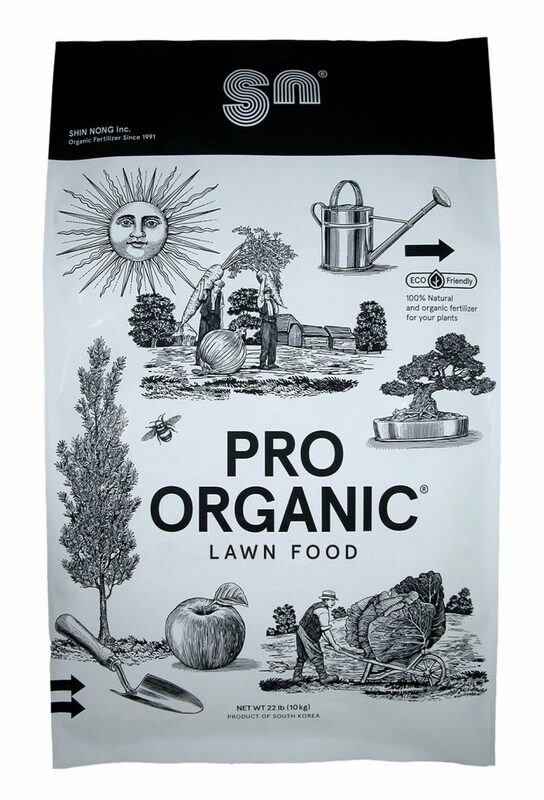 Organic with compost extract, this one’s absorbed very quickly and is good for small to medium crops. If you’ve had small tomatoes before this could be the one for you. Special blend of Microbes: Special blend of micronutrients and microbes. Concentrated: This one’s an interesting fertiliser as it’s very concentrated. You can get up to eight gallons of usable fertilizer from this small bottle. This makes it go a long way. Gets To Roots Easily: Because this is liquid fertilizer, it doesn’t need to be mixed into the soil. Simply spray or pour over the soil (once diluted) and it gets to the roots by itself. Instant Absorption: 100% bioavailable ingredients allow for instant absorption of some of the nutrients nutrients. Compared to dry compost for instance which may take years to reach 100% bioavailability. Special Blend of Microbes: The manufacturers claim their special blend of microbes helps the soil to work together with the plant to maximise absorption of nutrients. The microbes assist breaking down of soil components which make absorption of soil based nutrients much faster and easier. Organic: This is very important for the environmentally conscious gardener. More and more people are insisting on organic all the time. Prevents blossom end rot and grows a variety of vegetables. 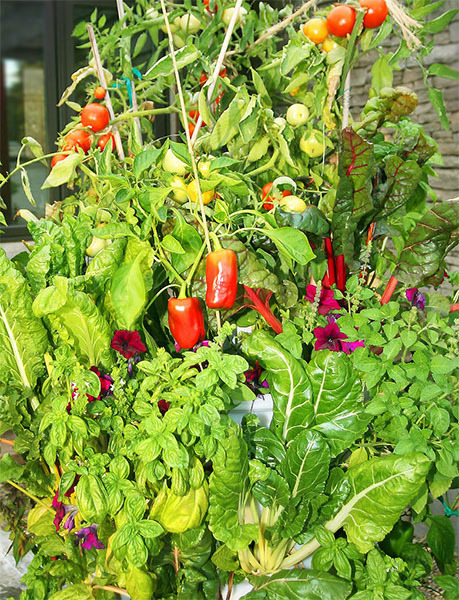 Great for the vegetable gardener who wants more than just tomatoes. Balanced Potassium: Good for tomatoes. Ratio 12-15-30: A slightly different ratio to normal tomato fertiliser. which promotes both the vine and the fruit. This results in a strong vine stalk, bright green leaves and many plump fruits. More Than Tomatoes: Due to the nutrient combinations in this fertiliser, you can use it for a variety of vine fruits and vegetables. 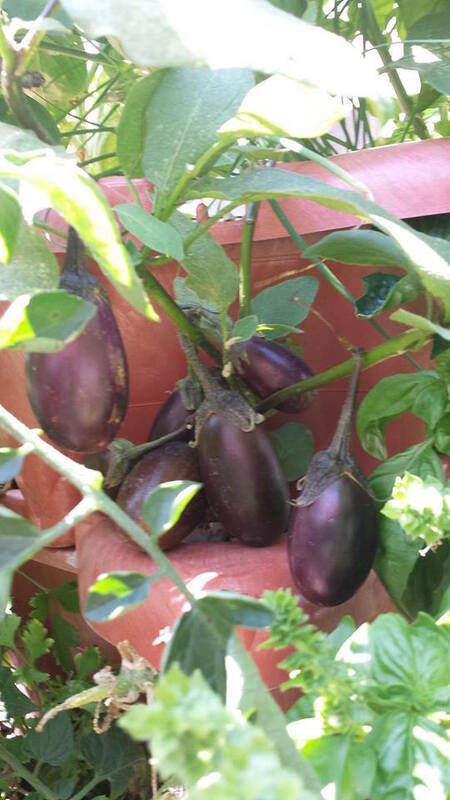 Tomatoes as well as eggplants, peppers, cucumbers, squashes and Zucchini can all be grown using this fertiliser. Contains Magnesium: Magnesium helps the plants flourish under a wide variety of soil conditions. Contains Calcium: Calcium is the nutrient that helps prevent blossom end rot. Micronutrients: As with many of our best fertilizer choices this one contains a special blend of micronutrients. This one makes our list because it can be used in a variety of soil types and is suitable for many different vine vegetables and fruits. Another one that prevents blossom end rot, this makes 256 gallons of fertilizer. Great for the gardener wishing to grow more than one vines. Also great value. Good Potassium Ratio: Helps fruits of vines grow. Amazing Value: You can make 256 gallons from this one tub. High Performance: A suitable N-P-K ratio combined with a special blend of micronutrients strengthens every part of the plant and promotes ripe red tomatoes. Refined by Trials: This fertilizer has been refined over 63 years of testing and trials. Over time the best resulting formula has been selected and is now always used. Use in a variety of ways: This formula is suitable for use in soil, pots, foil and hydroponics. Prevents Blossom End Rot: High calcium levels reduce the risk of blossom end rot. 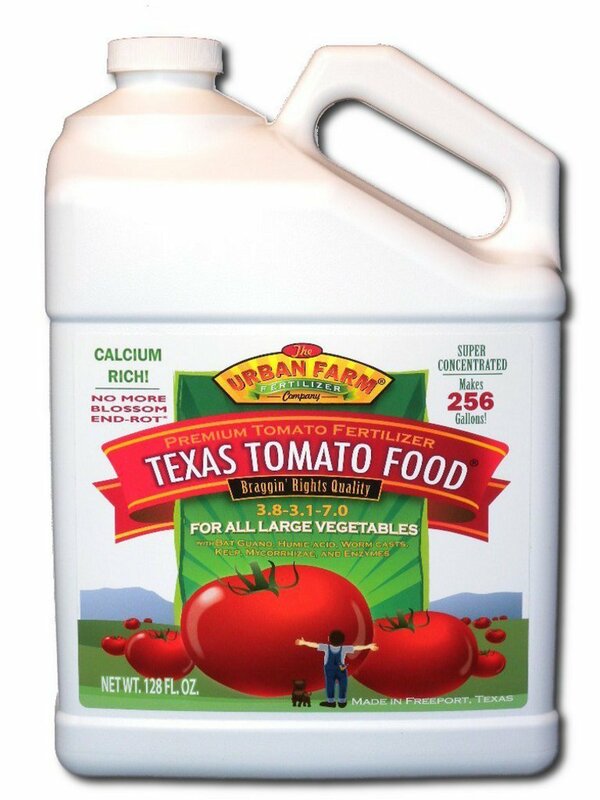 Amazing Value: With a concentration of 256-1 it’s possible to make 256 gallons of Texas Tomato fertilizer. This Texas fertilizer makes our list because it’s hydroponic friendly plus it can be diluted to 256 gallons. This makes it incredibly good value for money. A well established brand, this is an all round performer. Instant Feed: Fast acting micronutrients. Good Nutrient Ratio: Helps vine fruits and vegetables grow. Safe: Guaranteed not to burn plants when used as directed. Instant Absorption: Specially formulated micronutrients help fast feeding of the plants. NPK Ratio: Correct NPK ratio for tomatoes and other vine vegetables. Reliability: Miracle grow is a very famous name and well known brand. You can rely on this product. We couldn’t compile our list without including this famous name. Miracle grow is a widely established brand and one you can no doubt rely on. Please share your experiences with these fertilizers in the comments below. 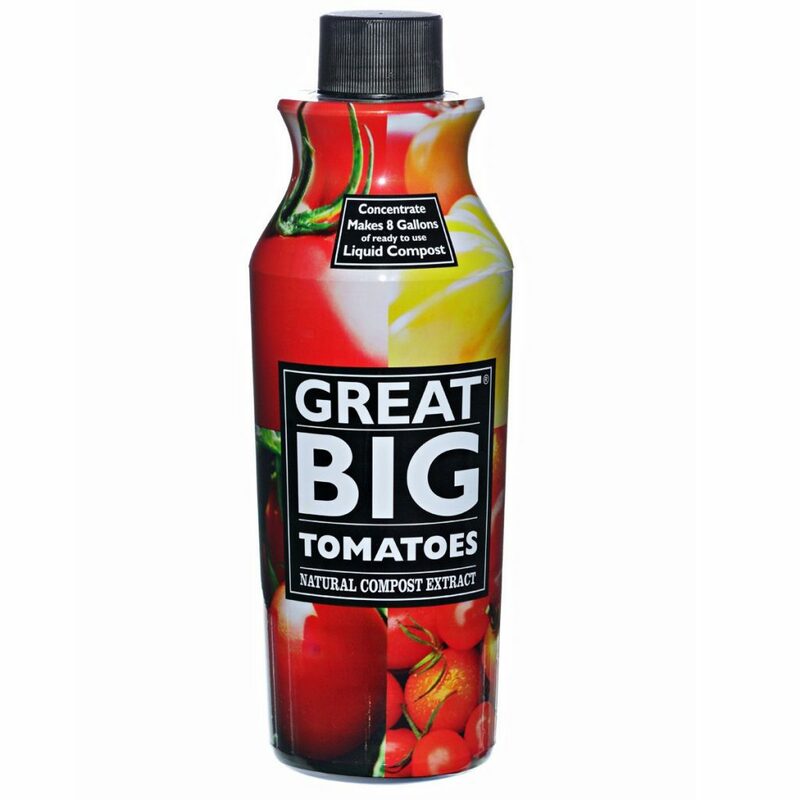 Alternatively, if you think we’ve missed out a great tomato fertilzer please tell us all about it. If you’ve ever struggled with digging and weeding before, don’t like bending down, or just want to try something different, straw bale gardening is worth a shot. We’ve put together our own straw bale gardening instructions to help you out. Many people just like you are getting great results with this new way of gardening. You can get started right now with this superb video that sums up the whole process in under five minutes. I’ve always found maintaining vegetable patches a bit annoying. Turning over a vegetable patch then weeding as the plants grow takes a lot of time. All that bending down can be back breaking work. Many people don’t have the space to grow their own crop either. They are limited to a patio or balcony. With this vertical garden the maintenance is significantly less. No digging or weeding is required and very little space is needed. You can grow fifty plants in just 4×4 feet of space. Read our Garden Tower Project review to see why so many people are tuning to this highly innovative tower. With Garden Tower Project (also known as the garden tower 2) you don’t have to dig or weed at all. Ongoing maintenance is really easy with watering just every week or two. You don’t really need to bend down either. The tower is only 4 feet by 4 feet so very little space is required. You can grow 50 plants in a very small space. A patio or balcony will be more than enough. These guys have actually grown from a really small company to a massive national company in just a few years. They started with their original tower, then recently released the garden tower 2. Many new features make Garden Tower Project’s new product way better than their first. Grow Organic: You can grow fresh organic food at home. No pesticides. Easy Assembly: Assembly is very simple. Many videos are provided. Not that you’ll need them, but in case you do there are many on their you tube channel. Video Help: They actually even have a complete set of short videos taking you through every stage of set up and use. From assembly to filling with soil, right through to the composting process, everything is covered. Small Space Required: You can grow in a very small space on a patio or garden. The towers is 43″ tall and only 25″ wide. With fifty slots that’s potentially a lot of fruit and vegetables in a small space. Grow Many Vegetables: You could maybe have a continuous supply of vegetables or fruit for you and your family. This is because of the fifty growing slots that we keep banging on about. Extendable: If that’s not enough for your appetites, you can even buy more plastic rings to extend the tower. Rotates on Rollers: The new rotating function allows for even sunlight distribution and easy access to all parts of the tower. You can turn the tower to make sure all plants get an even share of the sunlight. 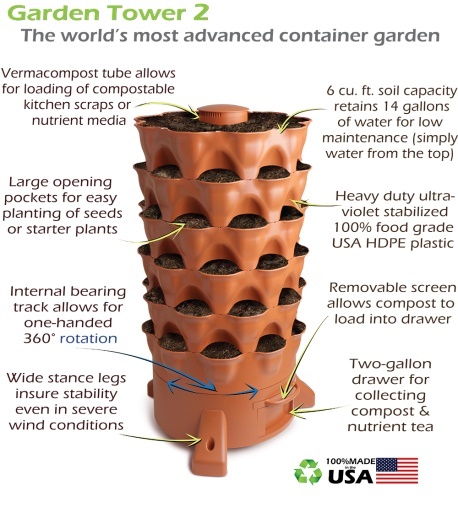 Compost Creation: You can create your own compost using the tower. Just put your kitchen scraps in the top. Worms from the earth section will do their work. Please Note: don’t put the worms in the middle core. They go in with the earth. 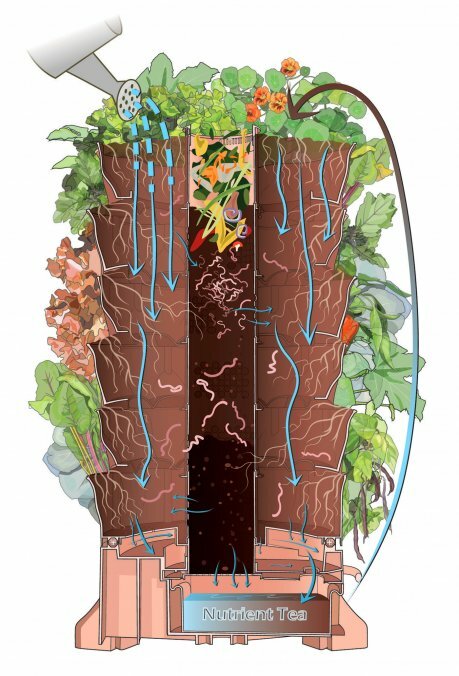 Inside the core of the tower, worms with your food scraps work together to create the compost which helps feed all the plants in the tower. You can easily access this nutrient dense fluid from the bottom of the gardening system. You then just feed it back into the top giving extra nutrients to the soil and the plants. Some customers say they put this in other areas of their gardens also. Easy Watering: Watering is minimal, as due to the design, run off is retained inside the system. Water can be recycled as it is also caught in the tray at the base of the tower. 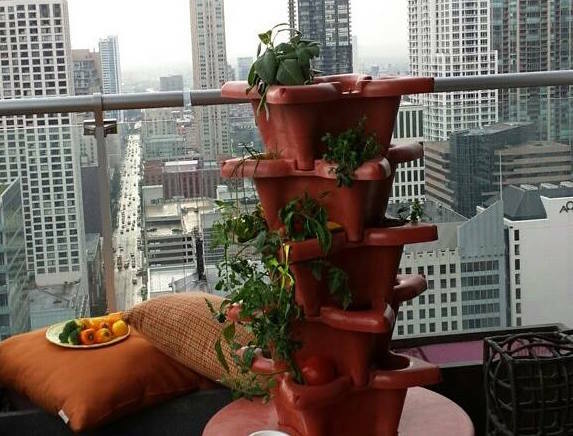 No Electrics or Pumps Required: There is no need for electric water pumps or electricity like hydroponic garden towers. Also as compared with hydroponic tower systems, there is no need for grow stones or grow medium. (Just soil and worms). Plant from Seed: Plants can be planted from seed. There is no need to have starter plants. Use Kitchen Waste: You can make use out of kitchen waste as part of your composting material. Easy Maintenance: Minimal looking after. No weeding or turning beds like conventional gardening. Food Safe Plastic: Food safety is guaranteed with the 100% UV stable food grade plastic. Solid Warranty: The company gives a three year warranty. The manufacturer claims the device can last twelve years. What are the Improvements on last time?? Better Nutrient Flow: 265% more minute holes in the core center mean that nutrients will get to your plants much faster. Less clogging is likely to happen. The compost goodness created by the worms and food waste can be transported more efficiently to plant roots. Stacking & Nesting Planting rings: You can build planting layers which house the plants. These layers are easily stacked on one another vertically. This means that the soil is not all in one big column lying on top of itself. It is in layers each supported by the plastic rings. Rotating Tower: The tower can turn 360 % as it has a set of bearings that allow it to be turned around. 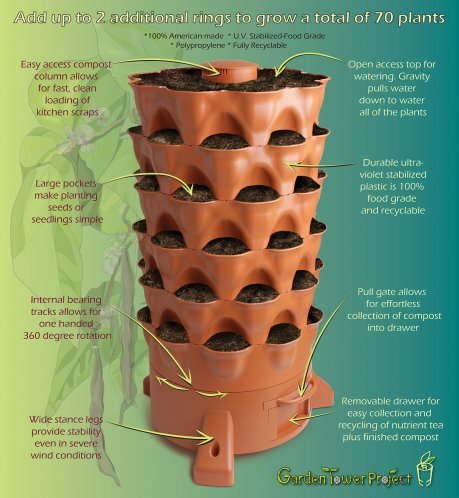 This lets you turn the tower whenever some plants aren’t getting enough sunlight. Very handy for differing times of year. Also a great benefit if your garden doesn’t allow for the tower to get sunlight on all sides. Removable compost tea drawer and compost screen: Collecting “compost tea” from the bottom of the tower has just been made a whole lot easier. Simply pull out the tray at the bottom and then pour the nutrients back into the soil or use in other parts of your garden. 100% Recyclable, Food-contact grade plastic: Specific plastic types have been left out including – No plasticizers, no BPA, no PVC, and no phthalates. 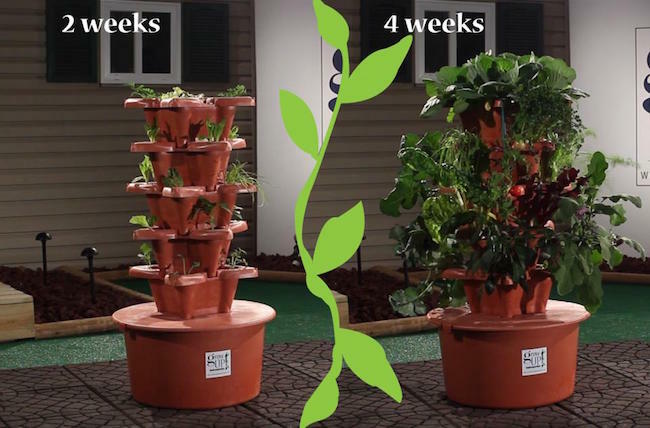 Only food-grade dye, antioxidant for long-term UV protection, and high quality USA made HDPE and polypropylene plastics have been used to make the Garden Tower 2. You can be assured of safe vegetables and fruit grown in this structure. Wider, Heavier, More Stable Feet: You can firmly attach the tower to any surface you like including a rooftop for example. Each foot weighs nearly a pound a piece and gives far greater stability than the previous version. Before feet were only sticks of wood and had to be stuck into the ground. Far Sturdier and More UV Resistant: The Garden Tower has been built stronger and tougher than last time. It’s five pounds heavier than before and now contains the highest amount of food-grade UV protection available in the industry. The company warranty is for three years. It is expected to have a minimum of seven years usage according to the company. They also claim that the seven years is a minimum expectancy even in very harsh climates. Actually almost anything. Smaller vegetables and leafy greens are best suited however. Bigger vegetables and fruits like squashes and melons can be grown on the bottom layer and allowed to trail onto the ground. Things like tomatoes can be grown. Although, providing a bit of support with a couple of canes and netting would help them out nicely. As usual we had a look at all the major merchant sites and some forums to see what customers are saying about this product. This way we can give you a rounded perspective of opinions and not just our own. Almost all customers are giving the Garden Tower 2 full marks with a 5/5 star rating. Out of 18 reviews 16 people gave 5/5 stars. The two critical reviews were only giving 1/5 star rating. It turns out one of the negative customers was actually reviewing the wrong product! The other negative reviewer had made a mistake in the use of the tower. Customer service had actually replied to the comment on Amazon and were already offering to take him through the issue and get it sorted for him. A good sign that the company wishes to help people with issues. We couldn’t find comments on Home Depot or Costco. Yes there were testimonials on the Garden Tower Project main website, but of course they would all be positive. Here are some other quotes from customers on Amazon. The Garden Tower Project have made a great job of improving on their first product. Rave reviews from customers on Amazon about both the product and the back up service from the company give us great confidence in recommending this item. We stand by our own 9.0/10 rating. There are a few merchants selling this product. Full retail price is set at $499. Although their own site often has the best deal it’s easier to order with soil and other extras from amazon. This way you can order everything you need from one place. Have a look for yourself and see what the current best offers are. If you have any extra questions about this product please ask in the comments below. If you love it or hate it please let us know. Any experiences you would like to share or any other products you would like us to review get in touch through the comments below. We’d love to hear from you and are always happy to help. 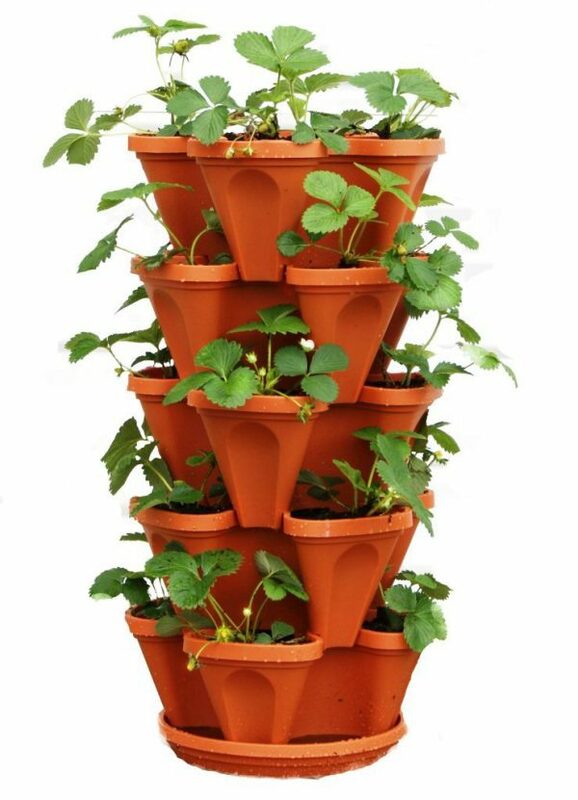 Usual methods for growing strawberries have always been to grow in the ground or in raised beds. The trouble is that the plants can be more exposed to the elements. Wind and rain or lack of sunlight can be detrimental to your budding harvest. 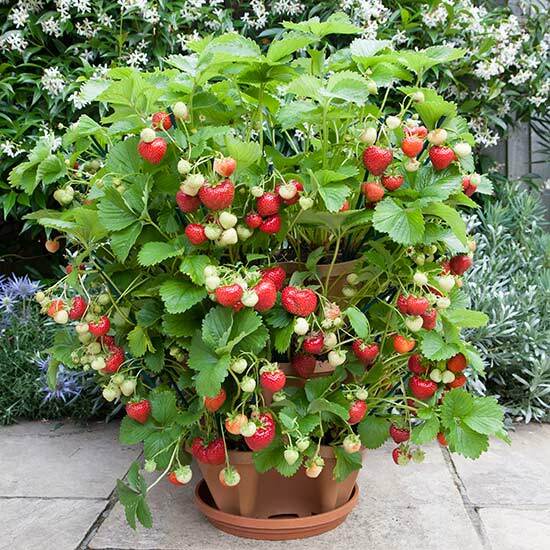 With our best strawberry planters you can place your strawberries anywhere you like. You can move them to the best spot any time you like to avoid harsh conditions. This way you get the best amount of sunlight and escape wind and rain at the same time. Traditional clay pots can be a real nuisance sometimes. They’re heavy, they break easily, and they take up lots of space. Mr Stacky Planters on the other hand are light weight, they won’t break and they totally maximise any small space. They’re even suited for use inside your home. In this Mr Stacky Planters review, we’ll be going over the pro’s and cons of this handy little range of stack-able pots. Growing food and plants in soil is great but it has a few problems. Tonnes of weeding needs to be done, pests are a serious problem and in winter you can’t grow anything at all. This is why thousands of people are turning to Hydroponic gardening. There’s no weeding, pests are almost completely gone, and it’s easily done indoors. This means you can grow all year round and you really don’t need much space either. In our Grow Up Hydrogarden Review you’ll see why this tower is a great way to get started in hydroponics. We think Grow Up Hydrogarden compares very well with other hydroponic towers. It has all the features you would expect yet comes at very reasonable price. Its not the Rolls Royce of hydroponics but it’s a great way to get started in this method of growing plants or food at home. In this starter Deluxe pack you really have everything you need to get going in the world of Hydroponics. 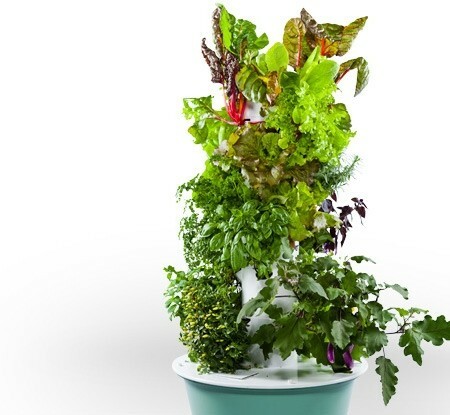 It’s not so pretty as the market leading Juice Plus Tower Garden, however at a $200 saving for practically the same system we consider it a great bargain. The full kit includes all nutrients and growth medium. (growth medium is what supports the plants instead of soil). The medium and nutrients could potentially last you all of your first year, this is good value. Growth medium, according to some users, can be washed in fresh water with some vinegar and used again. The system can be used outdoors or indoors as suits you best. 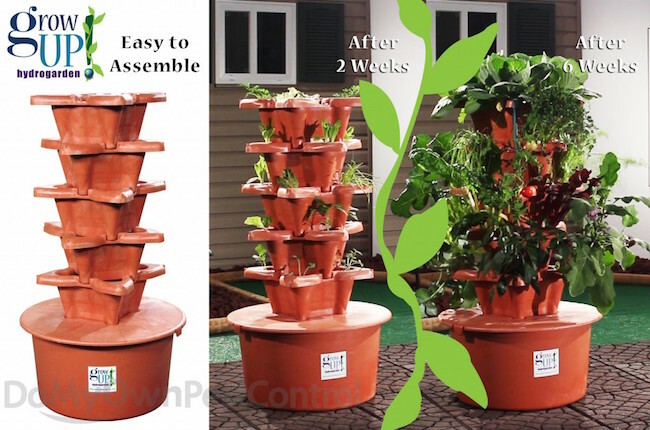 Five growing pots give you a growing capacity of twenty plants. (The same as Juice Plus system.) A great way to start. The growing pots are all food grade plastic. They are simply stacked on top of each other. 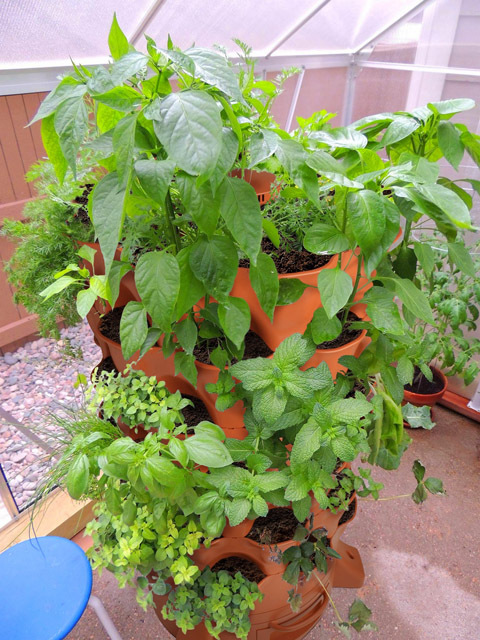 Buying more growing pots will allow you to increase the growing capacity. However you would need to upgrade your pump and tubing. Plants will get plenty air and water because of the supplied specialised growing stones and pump. Because of the small size you can get started on a small patio, porch, balcony or even inside your home. The pump is submersible so it can be stored in the twenty litre water tank and not be seen. This also makes it quieter. A twenty litre water tank means you are only watering the plants once a week or fortnight. Of course all the usual benefits of hydroponic gardening still apply. Compared to many systems, assembly is extremely simple. You do need to get your own seeds or starter plants from a nursery. Seeds do not fair well in the growing stones. Customer service through their Facebook page has a very quick response time. You can grow them in as little as three weeks. You can grow all year round. You can grow inside or outside. You can grow in a small space. Plants can be ready in three weeks. The unit is food safe. You can assemble very easily. What Are Customers Actually Saying? We scoured the internet and read different reviews on many merchant websites and forums. We saw that all of the benefits above are supported by many forum discussions and customer reviews on the top merchant websites. Costco, Amazon, and home Depot for example all have good customer reviews on this product. Home Depot: 4/5 star rating – From 1 customer review. Costco: 4.75/5 start rating – From four Customer reviews. As with all products some customers say good things, some say bad. In this case however the vast majority have good things to say. Reviews from customers who have both the Grow Up Hydrogarden and the Juice Plus Tower (sorry for always bringing that one up) actually say this product is better despite being $200 cheaper. are some of the many positive comments. There are some negative comments on these sites but they really are few and far between. Negatives were from people who had problems getting their plants to grow. “Not enough growing medium” and “The Grow Up started out good but turned out to be a POS”. The last customer, calling it a “POS”, claims to have followed all instructions correctly. Personally, we think that judging by all the other positive comments the chances are this person had made a mistake somewhere along the line. As over 95% of the fifty or so customer reviews that we have read are very positive we believe this to be genuinely a very good product. This product is well worth it’s price tag. You are ready to go, set up is fast and easy, and customer service gets a big thumbs up too. All the benefits of Hydroponic gardening still apply. No weeding, no pests, grow in doors if you wish. Grow all year round. All this for way less than may Hydroponic kits. It gets a solid 9/10 from us. Buying form merchants other than the official website is far cheaper. The official Hydrogarden website prices it at $299. If you have any extra questions about this product, any experiences you would like to share or any other products you would like us to review please get in touch through the comments below. I’m guessing you’re on the hunt for some kind of vegetable growing system? 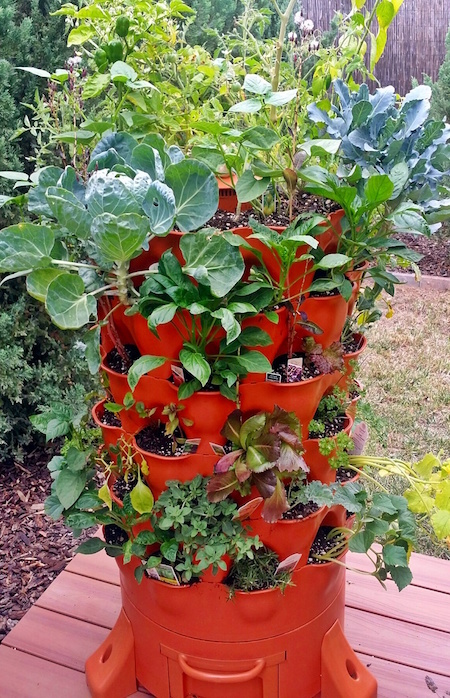 Namely the Tower Garden by Juice Plus. (pictured above). Before you jump in and read other websites, you really should be aware of the many problems surrounding some of the the Tower Garden growing system reviews. Here are a few words of warning prior to buying a new vertical growing system from this company.